Somalia is the classic example of a failed state. In the past two decades, there have been 14 attempts to reconstitute state authority, and the country has been constantly plagued by clan-based armed groups, Islamic extremists, regional proxy wars, terrorists pledging allegiance to al-Qaeda, pirates, kidnappings, and famine. But Somalia is not hopeless, and understanding its past is key to understanding the country’s current challenges and possibilities for the future. Between 1840 and 1886, the British East India Company established a series of trade treaties with various Somali chiefs. Italy also had a hand in the early establishment of Somalia and marked out the boundaries of Italian Somaliland in the south between 1897 and 1908. Ethiopia claimed the Ogaden region of western Somaliland in 1897. The first uprising against colonialism occurred when Somalis sought to push the Ethiopians out of the Ogaden region but then expanded to target European colonists as well. The Dervish State, headed Mohammed Abdille Hassan, an Ogaden himself who the British referred to as “Mad Mullah,” conducted a religious-based war of resistance against the Ethiopians and British from 1899 to 1920, resulting in the death of nearly one third of northern Somalia’s population. Great Britain defeated Hassan in 1920. Italy maintained control of Italian Somaliland as a part of its African empire (including Ethiopia and Eritrea) until 1941. During WWII Great Britain also took over these areas and ruled them as military protectorates until 1949, at which time the newly formed United Nations granted Italy a trusteeship over most of present-day Somalia. The British maintained a trusteeship over what is today the self-declared state of Somaliland. While the Italians dedicated significant effort towards developing their colony, Great Britain took a more hands-off approach to governance, leaving more responsibility in the hands of local leaders but also providing less by way of infrastructure. These distinctions are often cited as underpinnings of the incompatibility that would arise between the two areas. This colonial history, in addition to other dynamics, is also seen to play a role in the subsequent, contrasting levels of stability of Somalia and Somaliland. After the 10-year interim period, on June 26, 1960, the northern protectorate of Somaliland gained independence from Britain. Five days later on July 1, 1960, the two former colonies united to form the United Republic of Somalia under President Aden Abdullah Osman Daar, Prime Minister Abdirashid Ali Shermarke, and a 123-member National Assembly representing both territories. Daar ruled Somalia from 1960 until 1967. Shermarke succeeded him and led the country for two years until his assassination in 1969. Though northern and southern Somalia were united under one government, they operated as two separate countries, with different legal, administrative, and educational systems. On the day of Shermarke’s funeral, the Somali army, led by Mohamed Siad Barre, staged a bloodless coup. Barre, a charismatic dictator who fostered a cult of personality and called himself “Victorious Leader,” served as president and military ruler of Somalia from 1969-1991 and renamed the country the Somali Democratic Republic. Under Barre’s leadership Somalia sided with the Soviet Union in the Cold War. Though Barre outlawed clan loyalties and promoted his own “scientific socialism,” he supported clan elders to maintain control of rural areas. The new government, dominated by the only legal political party, the Supreme Revolutionary Council, or SRC, formed a guiding ideology based on a combination of Marxism and the Quran and led a “reeducation” campaign to eliminate opposition. In 1976, the SRC officially marked the end of military rule by dissolving itself and ceded power to its own creation, the Somali Revolutionary Socialist Party, or SRSP. 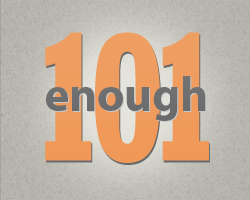 Next week’s Enough 101 will focus on Somalia’s more recent history. For more information and to see the sources used in this post, check out the Enough Project's Somalia Pinterest Board.